In 2016 Lachie Hinton traveled to Europe to document the largest refugee crisis since WWII. With a camera and sketchbook in hand, Hinton followed the refugee trail from Istanbul to Chios, Lesbos, Athens and Idomeni, documenting the individual stories behind news headlines. 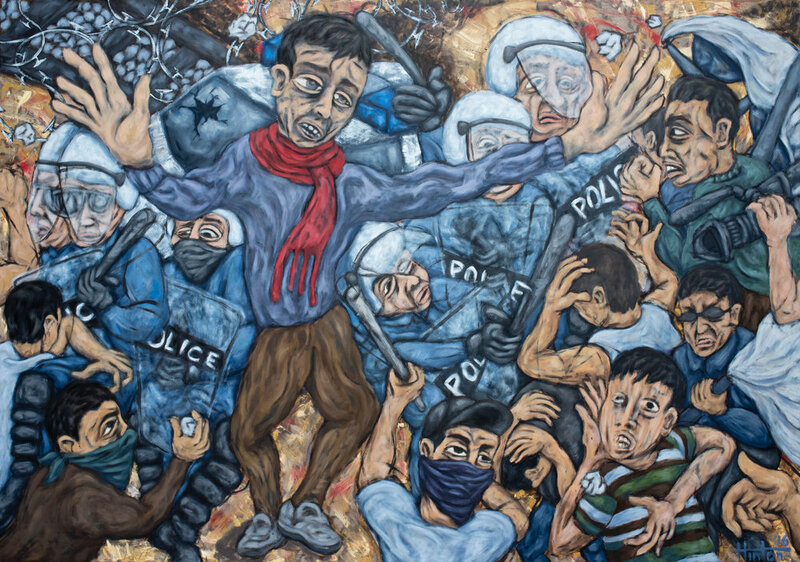 On the Refugee Trail to Europe brings together Hinton’s documentary photographs, sketches and oil paintings to challenge the rising anti-immigration sentiment in Europe. Hinton’s incongruous images of idyllic Greek islands dotted with displaced people reframes the current political debate, humanising the thousands of displaced Syrians, Iraqis and Afghans who have undertaken the journey into Europe. Hinton studied painting at George Gittoes studio and this stylistic influence resonates through his practice. Like Gittoes, Hinton is no stranger to zones of tension, having also traveled to North Korea in 2015. His last exhibition, Welcome to Pyongyang, held at Gaffa Gallery, documented his experiences in the North Korean capital.